"Besiege" and "Besieged" redirect here. For other uses, see Siege (disambiguation). A siege is a military blockade of a city, or fortress, with the intent of conquering by attrition, or a well-prepared assault. This derives from Latin: sedere, lit. 'to sit'. Siege warfare is a form of constant, low-intensity conflict characterized by one party holding a strong, static, defensive position. Consequently, an opportunity for negotiation between combatants is not uncommon, as proximity and fluctuating advantage can encourage diplomacy. The art of conducting and resisting sieges is called siege warfare, siegecraft, or poliorcetics. A siege occurs when an attacker encounters a city or fortress that cannot be easily taken by a quick assault, and which refuses to surrender. 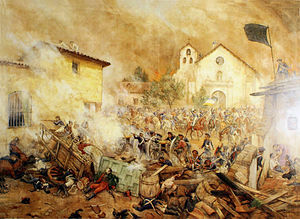 Sieges involve surrounding the target to block the provision of supplies and the reinforcement or escape of troops (a tactic known as "investment"). This is typically coupled with attempts to reduce the fortifications by means of siege engines, artillery bombardment, mining (also known as sapping), or the use of deception or treachery to bypass defenses. 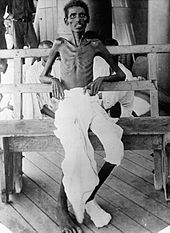 Failing a military outcome, sieges can often be decided by starvation, thirst, or disease, which can afflict either the attacker or defender. This form of siege, though, can take many months or even years, depending upon the size of the stores of food the fortified position holds. The attacking force can circumvallate the besieged place, which is to build a line of earth-works, consisting of a rampart and trench, surrounding it. 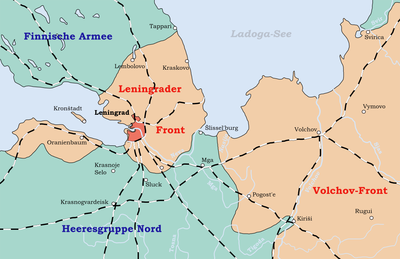 During the process of circumvallation, the attacking force can be set upon by another force, an ally of the besieged place, due to the lengthy amount of time required to force it to capitulate. A defensive ring of forts outside the ring of circumvallated forts, called contravallation, is also sometimes used to defend the attackers from outside. 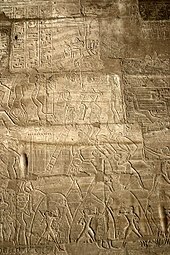 Ancient cities in the Middle East show archaeological evidence of having had fortified city walls. During the Warring States era of ancient China, there is both textual and archaeological evidence of prolonged sieges and siege machinery used against the defenders of city walls. Siege machinery was also a tradition of the ancient Greco-Roman world. During the Renaissance and the early modern period, siege warfare dominated the conduct of war in Europe. Leonardo da Vinci gained as much of his renown from the design of fortifications as from his artwork. Medieval campaigns were generally designed around a succession of sieges. In the Napoleonic era, increasing use of ever more powerful cannons reduced the value of fortifications. In the 20th century, the significance of the classical siege declined. With the advent of mobile warfare, a single fortified stronghold is no longer as decisive as it once was. While traditional sieges do still occur, they are not as common as they once were due to changes in modes of battle, principally the ease by which huge volumes of destructive power can be directed onto a static target. Modern sieges are more commonly the result of smaller hostage, militant, or extreme resisting arrest situations. 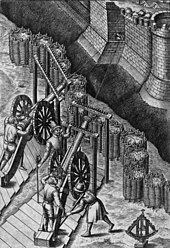 To end a siege more rapidly, various methods were developed in ancient and medieval times to counter fortifications, and a large variety of siege engines was developed for use by besieging armies. Ladders could be used to Escalade over the defenses. 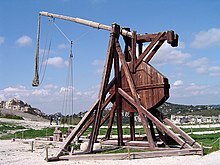 Battering rams and siege hooks could also be used to force through gates or walls, while catapults, ballistae, trebuchets, mangonels, and onagers could be used to launch projectiles to break down a city's fortifications and kill its defenders. A siege tower, a substantial structure built to equal or greater height than the fortification's walls, could allow the attackers to fire down upon the defenders and also advance troops to the wall with less danger than using ladders. A fire was often used as a weapon when dealing with wooden fortifications. The Byzantine Empire used Greek fire, which contained additives that made it hard to extinguish. Combined with a primitive flamethrower, it proved an effective offensive and defensive weapon. During the Warring States period in China (481–221 BC), warfare lost its honorable, gentlemen's duty that was found in the previous era of the Spring and Autumn period, and became more practical, competitive, cut-throat, and efficient for gaining victory. The Chinese invention of the hand-held, trigger-mechanism crossbow during this period revolutionized warfare, giving greater emphasis to infantry and cavalry and less to traditional chariot warfare. The philosophically pacifist Mohists (followers of the philosopher Mozi) of the 5th century BC believed in aiding the defensive warfare of smaller Chinese states against the hostile offensive warfare of larger domineering states. The Mohists were renowned in the smaller states (and the enemies of the larger states) for the inventions of siege machinery to scale or destroy walls. These included traction trebuchet catapults, eight-foot-high ballistas, a wheeled siege ramp with grappling hooks known as the Cloud Bridge (the protractible, folded ramp slinging forward by means of a counterweight with rope and pulley), and wheeled 'hook-carts' used to latch large iron hooks onto the tops of walls to pull them down. Advances in the prosecution of sieges in ancient and medieval times naturally encouraged the development of a variety of defensive countermeasures. In particular, medieval fortifications became progressively stronger—for example, the advent of the concentric castle from the period of the Crusades—and more dangerous to attackers—witness the increasing use of machicolations and murder-holes, as well the preparation of hot or incendiary substances. Arrowslits (also called arrow loops or loopholes), sally ports (airlock-like doors) for sallies and deep water wells were also integral means of resisting siege at this time. Particular attention would be paid to defending entrances, with gates protected by drawbridges, portcullises, and Barbicans. Moats and other water defenses, whether natural or augmented, were also vital to defenders. In the European Middle Ages, virtually all large cities had city walls—Dubrovnik in Dalmatia is a well-preserved example—and more important cities had citadels, forts, or castles. Great effort was expended to ensure a good water supply inside the city in case of siege. In some cases, long tunnels were constructed to carry water into the city. Complex systems of tunnels were used for storage and communications in medieval cities like Tábor in Bohemia, similar to those used much later in Vietnam during the Vietnam War. Until the invention of gunpowder-based weapons (and the resulting higher-velocity projectiles), the balance of power and logistics definitely favored the defender. With the invention of gunpowder, cannon and mortars and howitzers (in modern times), the traditional methods of defense became less effective against a determined siege. During the Peloponnesian War, one hundred sieges were attempted and fifty-eight ended with the surrender of the besieged area. The importance of siege warfare in the ancient period should not be underestimated. One of the contributing causes of Hannibal's inability to defeat Rome was his lack of siege engines, thus, while he was able to defeat Roman armies in the field, he was unable to capture Rome itself. The legionary armies of the Roman Republic and Empire are noted as being particularly skilled and determined in siege warfare. An astonishing number and variety of sieges, for example, formed the core of Julius Caesar's mid-1st-century BC conquest of Gaul (modern France). Muhammad, considered a prophet for Muslims, made use of sieges extensively during his military campaigns. The first use was during the Invasion of Banu Qaynuqa. According to Islamic tradition, the invasion of Banu Qaynuqa occurred in 624 AD. The Banu Qaynuqa were a Jewish tribe expelled by Muhammad for allegedly breaking the treaty known as the Constitution of Medina:209 by pinning the clothes of a Muslim woman, which led to her being stripped naked. A Muslim killed a Jew in retaliation, and the Jews in turn killed the Muslim man. This escalated to a chain of revenge killings, and enmity grew between Muslims and the Banu Qaynuqa, leading to the siege of their fortress. :122 The tribe eventually surrendered to Muhammad, who initially wanted to kill the members of Banu Qaynuqa, but ultimately yielded to Abdullah ibn Ubayy's insistence and agreed to expel the Qaynuqa. However, the Chinese were not completely defenseless, and from AD 1234 until 1279, the Southern Song Chinese held out against the enormous barrage of Mongol attacks. Much of this success in defense lay in the world's first use of gunpowder (i.e. with early flamethrowers, grenades, firearms, cannons, and land mines) to fight back against the Khitans, the Tanguts, the Jurchens, and then the Mongols. The greatest advantage of cannons over other siege weapons was the ability to fire a heavier projectile, farther, faster, and more often than previous weapons. They could also fire projectiles in a straight line, so that they could destroy the bases of high walls. Thus, 'old fashioned' walls – that is, high and, relatively, thin – were excellent targets, and, over time, easily demolished. In 1453, the great walls of Constantinople, the capital of the Byzantine Empire, were broken through in just six weeks by the 62 cannons of Mehmed II's army. Once siege guns were developed, the techniques for assaulting a town or fortress became well known and ritualized. The attacking army would surround a town. Then the town would be asked to surrender. If they did not comply, the besieging army would surround the town with temporary fortifications to stop sallies from the stronghold or relief getting in. The attackers would next build a length of trenches parallel to the defences (these are known as the "First parallel") and just out of range of the defending artillery. They would dig a trench (known as a Forward) towards the town in a zigzag pattern so that it could not be enfiladed by defending fire. Once they were within artillery range, they would dig another parallel (the Second Parallel) trench and fortify it with gun emplacements. This technique is commonly called entrenchment. 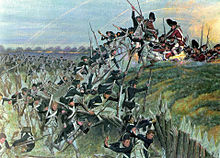 If necessary, using the first artillery fire for cover, the forces conducting the siege would repeat the process until they placed their guns close enough to be laid (aimed) accurately to make a breach in the fortifications. In order to allow the forlorn hope and support troops to get close enough to exploit the breach, more zigzag trenches could be dug even closer to the walls, with more parallel trenches to protect and conceal the attacking troops. After each step in the process, the besiegers would ask the besieged to surrender. If the forlorn hope stormed the breach successfully, the defenders could expect no mercy. In the early 15th century, Italian architect Leon Battista Alberti wrote a treatise entitled De Re aedificatoria, which theorized methods of building fortifications capable of withstanding the new guns. He proposed that walls be "built in uneven lines, like the teeth of a saw". He proposed star-shaped fortresses with low, thick walls. Experienced commanders on both sides in the English Civil War recommended the abandonment of garrisoned fortifications for two primary reasons. The first, as for example proposed by the Royalist Sir Richard Willis to King Charles, was that by abandoning the garrisoning of all but the most strategic locations in one's own territory, far more troops would be available for the field armies, and it was the field armies which would decide the conflict. The other argument was that by slighting potential strong points in one's own territory, an enemy expeditionary force, or local enemy rising, would find it more difficult to consolidate territorial gains against an inevitable counterattack. Sir John Meldrum put forward just such an argument to the Parliamentary Committee of Both Kingdoms, to justify his slighting of Gainsborough in Lincolnshire. The largest siege of the war, and arguably the roughest, most gruesome battle in history, was the Battle of Verdun. Whether the battle can be considered true siege warfare is debatable. Under the theories of Erich von Falkenhayn, it is more distinguishable as purely attrition with a coincidental presence of fortifications on the battlefield. When considering the plans of Crown Prince Wilhelm, purely concerned with taking the citadel and not with French casualty figures, it can be considered a true siege. The main fortifications were Fort Douaumont, Fort Vaux, and the fortified city of Verdun itself. The Germans, through the use of huge artillery bombardments, flamethrowers, and infiltration tactics, were able to capture both Vaux and Douaumont, but were never able to take the city, and eventually lost most of their gains. It was a battle that, despite the French ability to fend off the Germans, neither side won. The German losses were not worth the potential capture of the city, and the French casualties were not worth holding the symbol of her defence. The airbridge methods were developed and used extensively during the war. The logistics of airbridge operations were first developed in April 1942 as the British began flying military transport aircraft from India to China over the Hump, to resupply the Chinese war effort of Chiang Kai-shek and the units of the United States Army Air Forces (AAF) based in China. The airbridge methods which were developed were used extensively for supplying the Long Range Penetration Groups, (1943–1944). They were special operations units of the British and Indian armies, which saw action during the Burma Campaign. During the short Siege of Bastogne (December 1944) airbridge techniques were used to resupply the Allied defenders of Bastogne. Several times during the Cold War the western powers had to use their airbridge expertise. The Berlin Blockade from June 1948 to September 1949, the Western Powers flew over 200,000 flights, providing to West Berlin up to 8,893 tons of necessities each day. Airbridge was used extensively during the siege of Dien Bien Phu but failed to prevent its fall to the Việt Minh in 1954. Airbridge proved crucial during the siege of the American base at Khe Sanh in 1968. The resupply it provided kept the North Vietnamese Army from capturing the base. During the First Indochina War, the battles of Dien Bien Phu (1954) and Khe Sanh (1968) possessed siege-like characteristics. In both cases, the Viet Minh and NLF were able to cut off the opposing army by capturing the surrounding rugged terrain. At Dien Bien Phu, the French were unable to use air power to overcome the siege and were defeated. However, at Khe Sanh, a mere 14 years later, advances in air power – and a reduction in Vietnamese anti-aircraft capability – allowed the United States to withstand the siege. The resistance of US forces was assisted by the PAVN and PLAF forces' decision to use the Khe Sanh siege as a strategic distraction to allow their mobile warfare offensive, the first Tet Offensive, to unfold securely. Sieges of cities, like the Siege of Deir ez-Zor (2014–17) and Siege of al-Fu'ah and Kafriya are widespread in the Syrian civil war. ^ a b Fletcher & Cruickshank 1996, p. 20. ^ Stearns 2001, p. 17. ^ a b Needham, Volume 4, Part 2, 43. ^ Schofield, Louise (2006). The Mycenaeans. Los Angeles, CA: J. Paul Getty Museum. p. 78. ISBN 978-0-89236-867-9. ^ Needham, Volume 5, Part 6, 446. ^ a b The Oxford Encyclopedia of Medieval Warfare and Military Technology. Oxford University Press. 2010. pp. 266–267. ISBN 978-0-19-533403-6. ^ Hoskin 2006, p. 105. ^ a b Ebrey 2006, p. 29. ^ Turnbull 2002, p. 40. ^ Sellman 1954, p. 26. ^ Sellman 1954, p. 22. ^ Sellman 1954, pp. 44–45. ^ Campbell, Brian; Tritle, Lawrence A. (2013). The Oxford Handbook of Warfare in the Classical World. Oxford University Press. p. 644. ISBN 9780199333806. Retrieved 31 March 2019. ^ Cook, Michael, Muhammad, p. 21 . ^ Grousset 1970, p. 362. ^ Wheelis 2002, p. [page needed]. ^ Alchon 2003, p. 21. ^ Stewart 1998, p. 105. ^ "Define besieged | Dictionary and Thesaurus". besieged.askdefine.com. Retrieved 26 November 2018. ^ Townshend 2000, p. 211. ^ Townshend 2000, p. 212. ^ Beevor 2002, pp. 372–375. ^ Baldock 1809, pp. 515–520. One or more of the preceding sentences incorporates text from a publication now in the public domain: Chisholm, Hugh, ed. (1911). "Great Rebellion: 2. The Royalist and Parliamentarian Armies". Encyclopædia Britannica. 12 (11th ed.). Cambridge University Press. p. 403. ^ Symonds 1859, p. 270. ^ Firth 1902, p. 29. ^ Reynolds, Churchill & Miller 1916, p. 406. ^ Morocco 1984, p. 52. Alchon, Suzanne Austin (2003). A pest in the land: new world epidemics in a global perspective. University of New Mexico Press. p. 21. ISBN 0-8263-2871-7. Baldock, Thomas Stanford (1809). Cromwell as a Soldier. K. Paul, Trench, Trübner & Company. pp. 515–520. Beevor, Antony (2002). Berlin: The Downfall 1945. Viking-Penguin Books. ISBN 0-670-88695-5. Firth, C. H. (1902). Cromwell's Army: A History of the English Soldier During the Civil Wars, the Commonwealth and the Protectorate. Sussex: Methurn & Company. p. 29. Ebrey, Walthall, Palais (2006). East Asia: A Cultural, Social, and Political History. Boston: Houghton Mifflin Company. Fletcher, Banister; Cruickshank, Dan (1996). Sir Banister Fletcher's A History of Architecture (20th ed.). Architectural Press. p. 20. ISBN 0-7506-2267-9. Grousset, René (1970). The Empire of the Steppes: A History of Central Asia. Rutgers University Press. p. 362. ISBN 0-8135-1304-9. Hoskin, John, Carol Howland (2006). Vietnam. New Holland Publishers. p. 105. ISBN 978-1-84537-551-5. Stewart, William (1998). Dictionary of images and symbols in counselling (1st ed.). Jessica Kingsley. p. 105. ISBN 1-85302-351-5. Morocco, John (1984). Thunder from Above: Air War, 1941–1968. Boston: Boston Publishing Company. Needham, Joseph (1986). Science and Civilization in China. 4 (2). Taipei: Caves Books Ltd.
Needham, Joseph (1986). Science and Civilization in China. 5 (6). Taiepi: Caves Books Ltd.
Needham, Joseph (1986). Science and Civilization in China. 5 (7). Taipei: Caves Books Ltd.
Reynolds, Francis Joseph; Churchill, Allen Leon; Miller, Francis Trevelyan (1916). The story of the great war: history of the European War from official sources; complete historical records of events to date. P.F. Collier & Son. p. 406. Roland, Alex (1992). "Secrecy, Technology, and War: Greek Fire and the Defense of Byzantium, Technology and Culture". Technology and Culture. 33 (4): 655–679. doi:10.2307/3106585. JSTOR 3106585. Sellman, R. R. (1954). Castles and Fortresses. Methuen. Stearns, Peter N. (2001). The Encyclopedia of World History: ancient, medieval, and modern (6th ed.). Houghton Mifflin Books. p. 17. ISBN 0-395-65237-5. Symonds, Richard (1859). Long, Charles Edward (ed.). Diary of the Marches of the Royal Army During the Great Civil War. Works of the Camden Society. 74. The Camden Society. p. 270. Townshend, Charles (2000). The Oxford History of Modern War. Oxford University Press. pp. 211, 212. ISBN 0-19-285373-2. Turnbull, Stephen R. (2002). Siege Weapons of the Far East. Oxford: Osprey Publishing Ltd.
Wheelis, M. (2002). "Biological warfare at the 1346 siege of Caffa". Emerg Infect Dis. Center for Disease Control. 8 (9): 971–975. doi:10.3201/eid0809.010536. PMC 2732530. PMID 12194776. Windrow, Martin (2005). "The Last Valley: Dien Bien Phu and the French defeat in Vietnam". London: Cassell. Duffy, Christopher (1996) . Fire & Stone: The Science of Fortress Warfare (1660–1860) (2nd ed.). New York: Stackpole Books. Duffy, Christopher (1996). Siege Warfare: Fortress in the Early Modern World, 1494–1660. Routledge and Kegan Paul. Duffy, Christopher (1985). Siege Warfare, Volume II: The Fortress in the Age of Vauban and Frederick the Great. London: Routledge and Kegan Paul. Garlan, Yvon (1974). Recherches de poliorcétique grecque (in French). Paris: De Boccard. Lynn, John A. (1999). The Wars of Louis XIV. Pearson. ISBN 0582056292. May, Timothy. (27 June 2004). "Mongol Arms". Explorations in Empire, Pre-Modern Imperialism Tutorial: the Mongols. University of Wisconsin-Madison. Archived from the original on 18 May 2008. Ostwald, Jamel (2007). Vauban Under Siege: Engineering Efficiency and Martial Vigor in the War of the Spanish Succession. History of Warfare. 41 (illustrated ed.). BRILL. ISBN 90-04-15489-2. Bachrach, Bernard S (1994). "Medieval siege warfare: a reconnaissance". Journal of Military History. 58 (1): 119–133. JSTOR 2944182.